Simunition® is extremely happy to announce the official introduction of the Fitlight Tactical Training System to its current product line. All in a convenient military grade charging/transport case. n innovative technology for use in tactical training applications. 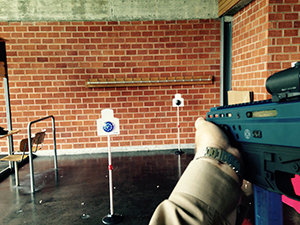 This target system allows new opportunities for Force on Target training in shoot house environments, on ranges and in a variety of other training environments. The Fitlight Tactical Training System is the most multipurpose technology being introduced to the tactical industry today. This tactical target system allows new opportunities for force on target training in shoot house environments, on range programs and a variety of unique training environments. 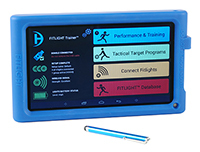 The Fitlight Tactical Training System is a wireless system comprised of 4, 8 or more RGB (Red Green Blue) LED powered Light Sensors and a Tablet Controller. 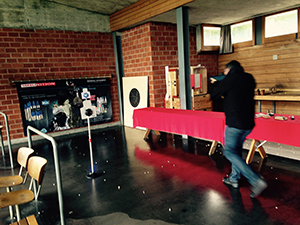 The Silhouette Target and Light Sensors are used as a visual cue for the shooter to engage or not engage potential targets as per the training scenario. Various measurements can be captured for immediate feedback in relation to the user's performance or can later be downloaded to a central computer for future analysis. The Lights Sensors can be activated/deactivated by the motion of the users hands, feet, body, or by direct impact of a Simunition® FX® or CQT® projectile. The lights can be programmed to be activated / deactivated by direct contact or proximity sensing whereby the system is able to record time for any training function. The system is extremely easy to set up and use, and training routines can be preprogrammed into the Tablet Controller or easily developed on site by the user. 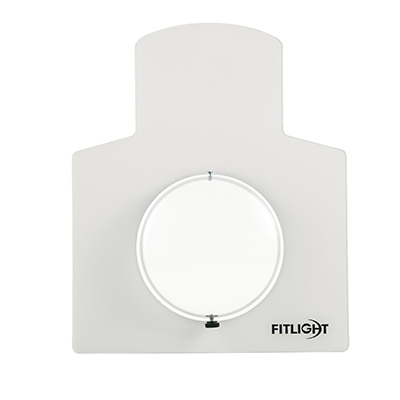 The Silhouette Target and Light Sensor can be mounted on walls, floors or any apparatus and used to enhance the training and condition the user according to the training objectives. Additionally the Light Sensors can be mounted whereby they simulate real tactical specific situations, such as in tactical shoot houses and real world environments. The Fitlight Tactical Training System is a new system now available to the tactical training community. The Target Silhouettes are engineered using high quality materials to withstand high velocity impacts from FX and CQT Reduced Energy projectiles. The Target Silhouette is formed such that it allows the Light Sensor to fit easily behind the target. The Target Silhouettes and Light Sensor also allow for simple attachment to walls, poles or other objects. The Light Sensors allow the shooter to view up to six colored LED lights. They can be adjusted to different brightness intensities or size of light. The accelerometer in the light sensor will score impacts on the target and provide reaction times to hitting that target. 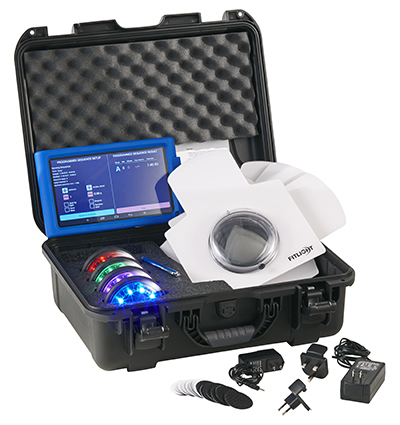 The Fitlight Tactical Training System allows for a multitude of possible programming options, from multiple color lights activating at the same time, random or as per programmed straining scenario sequence. 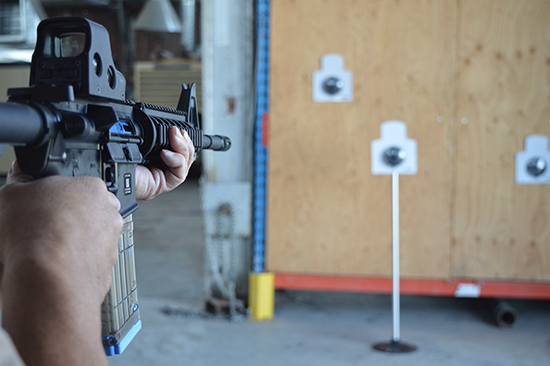 The firearms instructor can program shoot no-shoot protocols using a variety of options with respect to colors and sequence of targets. The applications are endless. 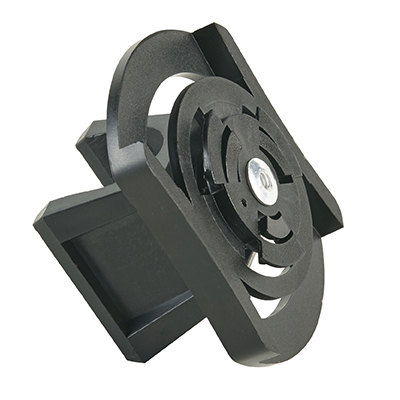 Formed Tactical Target Silhouettes are custom designed to hold the Fitlight Light Sensors in position and act as a target to fire a variety of projectiles on. The human silhouette is backed with a white vinyl and has a transparent center to view the light in both indoor and outdoor conditions. This target Silhouette can be easily applied to walls and other objects using Velcro Pads or can easily attach to Fitlight Aluminum Pole. Velcro pads will allow the client to apply both the Light Sensors on their own and the Target Silhouette to a wide variety of objects in a wide variety of environments. An example of this would be in shoot houses you could put Light Sensors in door frames or hallways and use them as a proximity sensor to then activate targets in rooms or other areas. The tabs can also be applied to the backs of the targets and securely attached to walls or objects in these environments. Once the target is impacted with a projectile it will provide impact feedback to the operator. The Velcro Lock comes on the back of each Light Sensor when sold. These are used to fix the Light Sensors using the Velcro Locks to all types of surfaces and objects. They can be removed by pushing in and turning the back of the light. 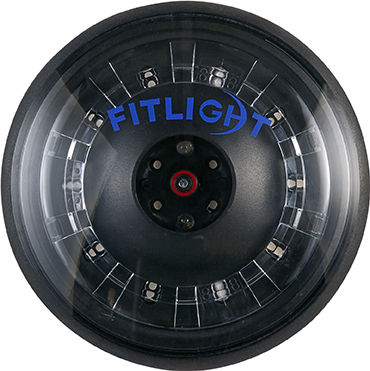 Even though the Fitlight Training System comes with 4 or 8 Light Sensors, additional Light Sensors can be added to the kit at any time. Each additional Light Sensor can be purchased separately or added to the cost of the system at the time of the order. It is recommended to keep an inventory of Light Sensors for quick and easy delivery to your clients. The trend to date has shown that more than 50% of the clients that order a four light systems order additional lights within 90 days. 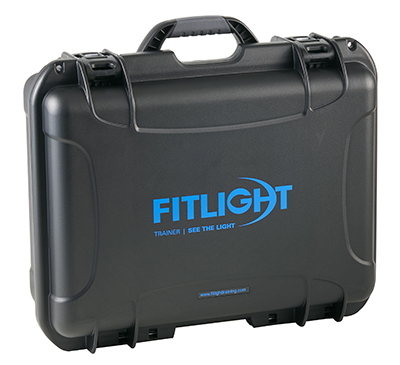 The Fitlight Tactical System comes with 4 and 8 light military grade charging cases. The features include custom foam inserts to hold and charge the lights, store the Tablet Controller and accessories. The dimensions and weight of the case allow for easy transport on airplane overhead storage. All electrical statistics and case dimensions are included online. Come with interchangeable, international power adaptors. Black rubber basses are part of the pole set. They have a 1opening in the center and are low profiled for better stability and functionality. The aluminum tube inserts into these bases which come in weights of 5 lbs. The Fitlight Tablet Controller comes with each system set. It is the heart of the system and where all light operating functions and protocols are programmed and run. The blue protective cover should never be removed from this tablet. Aluminum Pole Connector is used for connecting two 4 long, (1) diameter tapped poles together to make longer lengths. 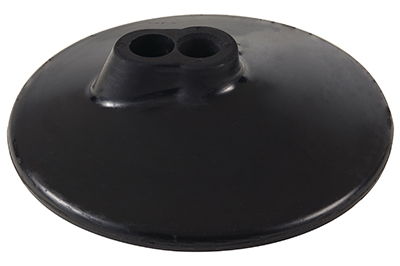 These are incorporated with the heavy base feet and thumb screws for greater stability. The pole is 1 diameter silver anodized aluminum tubes that comes in standard 4' lengths. The pole can be lengthened by aluminum frame extenders that slip inside the pole to allow the attachment of another 4' attachment of another 4' length. They are very durable and function well in traditional tactical settings. Note that the Rubber Base is sold separately.